Angiogenesis, the growth of new blood vessels from existing vessels, contributes to both normal tissue growth and tumorigenesis in cancer. 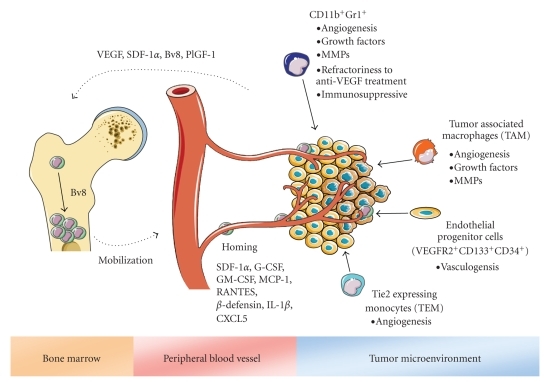 Angiogenesis is a fundamental step in the transition of tumors from a dormant state to a malignant one, leading to the use of angiogenesis inhibitors as possible cancer therapeutics. Angiogenesis is also a target for combating diseases characterized by either poor vascularization or abnormal vasculature. Application of specific compounds that may inhibit or induce the creation of new blood vessels in the body may help combat such diseases as in the case of ischemic chronic wounds and age-related macular degeneration. Malignant tumor: In cancer, cells divide and grow uncontrollably, forming malignant tumors, and invade nearby parts of the body. The cancer may also spread to more distant parts of the body through the lymphatic system or bloodstream. Angiogenesis inhibitors: A substance that inhibits the growth of new blood vessels (angiogenesis). Some angiogenesis inhibitors are a normal part of the body’s control, some are administered as drugs, and some come from diet. VEGF: Signal protein produced by cells that stimulates vasculogenesis and angiogenesis. It is part of the system that restores the oxygen supply to tissues when blood circulation is inadequate. Angiogenesis is the physiological process involving the growth of new blood vessels from preexisting vessels. It is a normal and vital process in growth and development, as well as in wound healing and in the formation of granulation tissue. It is also a fundamental step in the transition of tumors from a dormant state to a malignant one, leading to the use of angiogenesis inhibitors. Tumors cannot grow beyond a certain size, generally 1–2 mm, due to a lack of oxygen and other essential nutrients. Cancer cells are cells that have lost their ability to divide in a controlled fashion. A malignant tumor consists of a population of rapidly-dividing and growing cancer cells. Mutations quickly accrue within the population. These mutations (variations) allow the cancer cells (or sub-populations of cancer cells within a tumor) to develop drug resistance and escape therapy. Tumors induce blood vessel growth (angiogenesis) by secreting various growth factors (e.g., VEGF ). Growth factors such as bFGF and VEGF can induce capillary growth into the tumor, which some researchers suspect supply the required nutrients that allow for tumor expansion. Bone marrow cell recruitment also participates in tumor angiogenesis. Tumor Angiogenesis: The switch to the angiogenic phenotype occurs during multistage tumorigenesis. As malignancy develops, cells progress from a prevascular stage (normal to early hyperplasia) to a vascular stage (late hyperplasia to dysplasia to invasive carcinoma). Angiogenesis becomes clearly evident during dysplasia and is critical for further growth. Targeting tumor angiogenesis may be a novel strategy for preventing cancer. In 2007, it was discovered that cancerous cells stop producing the anti-VEGF enzyme PKG. In normal cells (but not in cancerous ones), PKG apparently limits beta-catenin, which solicits angiogenesis. Other clinicians believe angiogenesis really serves as a waste pathway, taking away the biological end products secreted by rapidly-dividing cancer cells. In either case, angiogenesis is a necessary and required step for the transition from a small, harmless cluster of cells, often said to be about the size of the metal ball at the end of a ball-point pen, to a large tumor. Angiogenesis is also required for the spread of a tumor, or metastasis. Single cancer cells can break away from an established solid tumor, enter the blood vessel, and be carried to a distant site, where they can implant and begin the growth of a secondary tumor. Evidence now suggests the blood vessel in a given solid tumor may, in fact, be mosaic vessels, composed of endothelial cells and tumor cells. This mosaicity allows for substantial shedding of tumor cells into the vasculature, possibly contributing to the appearance of circulating tumor cells in the peripheral blood of patients with malignancies. The subsequent growth of such metastases will also require a supply of nutrients and oxygen and a waste disposal pathway. Angiogenesis also represents an excellent therapeutic target for the treatment of cardiovascular disease. It is a potent, physiological process that underlies the natural manner in which our bodies respond to a diminution of blood supply to vital organs, namely the production of new collateral vessels to overcome the ischemic insult. A large number of preclinical studies have been performed with protein-, gene- and cell-based therapies in animal models of cardiac ischemia, as well as models of peripheral artery disease. Reproducible and credible successes in these early animal studies led to high enthusiasm that this new therapeutic approach could be rapidly translated to a clinical benefit for millions of patients in the Western world suffering from these disorders. A decade of clinical testing both gene- and protein-based therapies designed to stimulate angiogenesis in underperfused tissues and organs, however, has led from one disappointment to another. Although all of these preclinical readouts, which offered great promise for the transition of angiogenesis therapy from animals to humans were, in one fashion or another, incorporated into early stage clinical trials, the FDA has, to date (2007), insisted that the primary endpoint for approval of an angiogenic agent must be an improvement in exercise performance of treated patients. Overexpression of VEGF causes increased permeability in blood vessels in addition to stimulating angiogenesis. In wet macular degeneration, VEGF causes proliferation of capillaries into the retina. Since the increase in angiogenesis also causes edema, blood, and other retinal fluids leak into the retina, causing loss of vision. A novel treatment of this disease is to use a VEGF-inhibiting siRNA to stop the main signaling cascade for angiogenesis.